India-Pakistan relations have swung from absurdity to ridiculousness since the 1947 partition. Imran Khan’s victory in the recently concluded General Elections went as per preordained script. The arrest of Nawaz Sharif and his daughter in a money laundering case practically sealed the deal. The Supreme Court has debarred him from contesting elections for life, virtually putting an end to the political career of the former prime minister. It is alleged that Imran enjoys the confidence and support of the establishment which paved the way for Pakistan Tehreek-e-Insaf (PTI) to emerge victorious. The opposition has questioned the legitimacy of the elections, especially where it is alleged that widespread rigging was allowed to take place to favour one party. The political pundits had predicted, even before the first vote was cast, that Imran would win the elections hands down because of the tremendous support he receives. However, it can’t be denied that in spite of questions being raised about the fairness of the elections, Imran enjoys tremendous goodwill amongst a large section of the population, mainly for his integrity. PTI could muster only 115 seats, and they have fallen short of 22 seats to able to form the government without a coalition. It is hoped that both the independents and other smaller parties will back PTI in this regard. Today, Pakistan faces an unprecedented economic crisis and requires the assistance of the International Monetary Fund (IMF) to bail it out. However, the IMF will force Pakistan to make tough and painful structural adjustments. The US, on the other hand, has refused to help Pakistan until it abandons nurturing terror groups. It is for this reason that Pakistan, today, requires a strong leader, who has the ability to take some hard and unpopular decisions to resuscitate the economy. In his address to the nation, Imran came across as a person with good intentions. Recognising the poor relations of Pakistan with some of its immediate neighbouring countries, especially Afghanistan and India, he expressed his desire to improve ties to ensure peace and stability in the region. He has also assured the people of Pakistan to root out corruption and has offered to subject himself before the National Accountability Bureau (NAB). He has also committed to creating a ‘Naya Pakistan’ which will focus on creating a welfare state. In spite of Imran’s inexperience in governance, he has the making of a good leader, a skill honed during his captaincy, with the ability to take all the sections of society with him. His commitment to protect the interests of the minorities is praiseworthy. India-Pakistan relations have swung from absurdity to ridiculousness since the 1947 Partition. Earlier, the attempts of former Indian Prime Minister Atal Behari Vajpayee and Nawaz, which led to the signing of the famous “Lahore declaration” to resolve all outstanding issues through dialogue, was sabotaged by forces inimical to any betterment of ties. Similarly, former Prime Minister of India Manmohan Singh and the former Prime Minister of Pakistan Yousaf Raza Gillani, had issued a statement at Sharm el-Sheikh for improving ties, but Pakistan’s former premier’s attempt to include Balochistan in the statement led to protests in India. Modi’s meeting with Nawaz in Lahore was also followed by terror strikes at the Indian Air Force Base in Pathankot. India accused Pakistan of sending terrorists from across the border and refused to engage with it till it stops funding and arming the terror organisations. It impinges on India to start the process of dialogue, if there is a genuine intention of improving ties. Once the relation improves, the sponsors of terrorism will be compelled to abandon the state-sponsored policy. There are lots of expectations from Imran, who, unlike Nawaz, is on the establishment’s good side. It is a well-known fact that the foreign policy, especially with India and Afghanistan, is decided by the army to a certain degree. 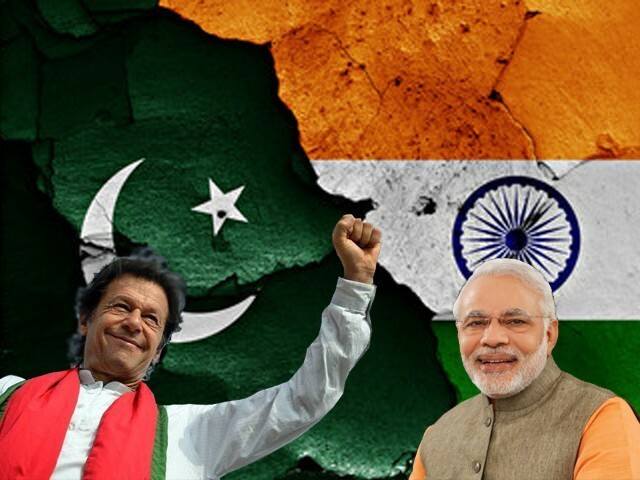 The political pundits in India are diffident whether Imran would have complete freedom and liberty to steer the foreign policy with India and Afghanistan. It would make sense for Imran to take the army on board in all future negotiations with India. Imran in his speech said that if India takes one step forward, Pakistan will take two steps forward. The Indian government should accept his offer in all its sincerity and resume the dialogue. The people on both sides of the border have suffered immensely through cross border violations. No one has benefitted from them. Both the countries need “out of the box” solutions for improving the ties. Today, Pakistan needs stability and peace so that the government can use all its precious time and resources for the betterment of its people. Moreover, at a time, when billions of dollars are being poured by China in China-Pakistan Economic Corridor (CPEC), there is an urgent need for peace in the region. India and Pakistan have seen enough blood, it is now time that the two countries join hands and solve their issues. We owe it to our future generations to establish peace in our region. India should take the step forward and extend the hand of friendship to Pakistan’s new prime minister. With the promise of Naya Pakistan, we should also work towards Naye Indo-Pak relations. or any moves to better relationships between the two countries. hate, bigotry, white suprematism and misogynist views. and enmity. If peace prevails, they lose their grip on power, on elections. will shrink, because peace will mean no more ‘perpetual’ arms race. This man is either delusional or naive. We should ask expert in this area to understand the future of India Pak relationship. Not some journalist. Modi has already called and greeted Imran. It has been widely reported in the press but perhaps the blog writer did not get the memo. It will come down to how sincere Modi Sarkar [Butcher of Gujrat] is in having good relations with Pakistan and more importantly, how much is his hatred for Muslims. [Modi was involved in both] has to have a reckoning. We have seen too many times when Bharati army bases with 5 rings of security, get infiltrated by so called “terrorists” from “across the border” meaning Pakistan. Very obviously Hindustanis are nincompoops when it comes to army base security. OR they are attacking their own bases. How else can you describe these incidents? So, Hinduland is killing it’s own soldiers or they don’t know security. Your response would have been ‘……………’ a deep silence. otherwise? Like 10 or 12 wars ? All won by ‘bahadur sanikon’. Say, Paks beat Hinduland in the 1948 war, they almost took Srinagar. They trounced Bharat in the Rann of Kutch affair. April 1965. Be glad that the Paks did not take Rajasthan. They beat the living daylights out of Hindustan in the Sept.1965 war. nincompoop Nawaz Sharif stepped in and stopped the Pak’s advance. Nawaz is now sitting in jail. Did not play the videos. Might have viruses, malwares embedded. Either by you or your patron, Amit Shah, from the Mothership RSS. Would never trust videos provided by Hindustanis Hindus. Never. Looks like old generals/politicians in their dotage or with Alzheimers disease expounding forth. Videos churned out from the PM’s basement? Or good Hindu actors portraying Pakistanis. Or Photo-shopped? for, ‘ videos posted by Pak media.’ So this is what you do. Work in the Hindustani propaganda ministry. Oh well. any sanghi office will do, for producing videos. Wonder why are you loitering on a Pakistani e-paper website. Well hard to believe a Hindu is non believer in the Vermillion Lord. Could be you are girje ka sahaayak. Or Sadhvi Prachi’so intern. You should be spending more time worrying about the millions and millions toilet less Hindu men women and children. Could use you as a pen pushing munshi. for foot soldiers. Their offices are in Dilli.